On October 15, 2017, the official opening of Xi'an AIER Eye Hospital means the goal of opening 200 specialized ophthalmic hospitals in mainland China proposed two years ago was achieved ahead of schedule. Build global network, promote "healthy China 2030"
As of October 15th, 2017, AIER Eye Hospital Group has established more than 200 specialized eye hospitals covering 30 provinces all over the country, and nearly 90 eye clinics and hospitals in Hongkong, the US and Europe. 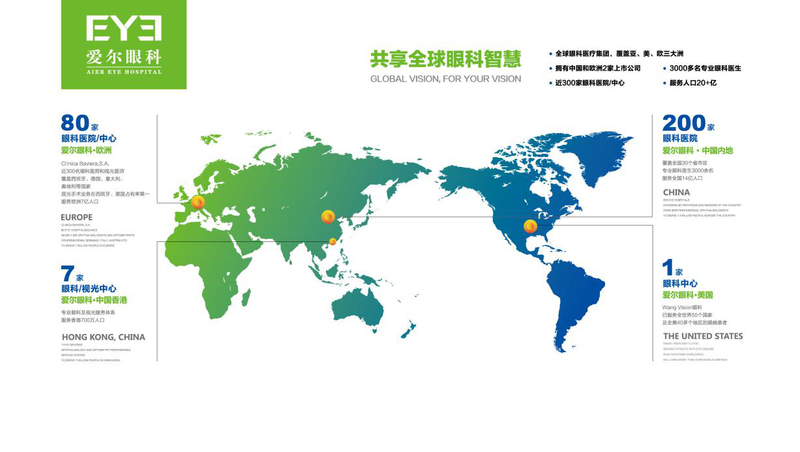 AIER is the only ophthalmic medical chain operating 2 listed companies in China and Europe, serving 2 billion people all over Asia, Europe and North America. As the leader in the ophthalmic medical care industry globally, AEIR has strengthened its talent pool with top eye doctors in Europe, the state council special allowance experts, doctoral and master supervisors, postdoctoral associate, visiting scholar from Europe and the US and core experts with rich clinical experiences. AEIR commits itself to integrate global ophthalmic resources and technologies, increase clinical and research exchanges both at home and abroad, providing more high-quality services to its patients. In addition, AIER intensifies the implementation of the hierarchical chain mode, balances medical resources, and promotes further implementation of the national hierarchical diagnosis and treatment policy. AIER also actively engages in public welfare programs with other agencies, such as "Visual Health Precision Poverty Alleviation" and "The Belt and Road Initiative: Loving overseas Chinese – Bright Journey". Utilizing AIER’s status and resources in the industry, AIER is destined to make "healthy China 2030" a success. Just as AIER’s mission says-"Enabling everyone, whether poor or rich, has the right to eye health". In Xi'an AIER Eye Hospital, the backbone team is composed by doctors with advanced degrees. The hospital has cataract, glaucoma, fundus, ocular surface and corneal disease, eye plastic surgery, oblique amblyopia and pediatric ophthalmology, refractive surgery, medical optometry, visual function and other ophthalmic sub-professional departments. The hospital is equipped with German ZEISS full femtosecond laser surgery system, Constellation TT vitrectomy PHACO all-in-one machine and many other state-of-the-art ophthalmic equipment. With international management concept and all those AIER hospitals across three continents, Xi'an AIER Eye Hospital set up a "famous doctor" center, bringing world renowned domestic and foreign doctors to the doorstep of people of Xi'an. It also set up the Presbyopia treatment and eye plastic operation and other services to meet the demands at different levels.